Allergic reaction rashes occur when individuals come into contact with one or more allergens that affect the skin. These allergens do not necessarily have to come into contact only with the skin. Skin allergens can come from a variety of sources and manifest in many ways. An allergic reaction can affect nearly anyone at any time. Allergies may begin at birth or at a time later in life. This means that there are a number of possible causes for an unexpected rash. The following are just some of the most common reasons for allergic reaction rashes. Poison ivy and poison oak are two common causes of body rashes. While not everyone is allergic to these plants, a great number of people are. These individuals may experience a mild reaction to severe body rash that can include other symptoms, such as flu or cold symptoms and even fever. Though medicines are usually a source of healing, in rare cases they can actually be the cause of an allergic reaction. The symptoms of an allergic reaction to medication vary based on the medicine and the individual. A body rash is very common for this type of allergy, however. 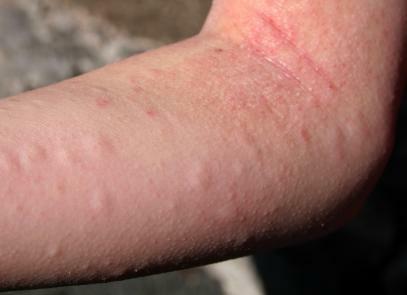 Bites from insects or animals can cause an allergic reaction of the skin. Depending on the severity of the reaction and whether other symptoms accompany the rash, it may be necessary to seek medical treatment to prevent infection, further symptoms, or a spread of the rash. In addition to bites, insect stings can trigger an allergic reaction. In some cases, this skin rash is one of many symptoms that could have serious health consequences. If a person has a mild to severe reaction on the first contact with an allergen, it is possible that subsequent contacts may increase in severity. This happens particularly with bee stings, so it's important to avoid future contact with known allergens when at all possible, especially if you wish to avoid potentially serious complications. It can be somewhat difficult to identify this type of body rash. A rash occurring from an allergen will affect people differently and may not always appear in the same place on the body. Here are a few ways to recognize a rash. Welts and bumps - These can occur in a cluster or all over a region or area of the body. They may or may not appear red and puffy. Warmth - Some rashes are warm to the touch. Itchy skin - Many body rashes are itchy and painful. Swelling - Some rashes will cause skin to swell in areas. Blisters - Blistering of the skin may indicate a skin rash. In a small number of cases, an allergic reaction may cause not only a skin rash but a serious condition called anaphylactic shock or anaphylaxis. Those with anaphylaxis may experience drops in blood pressure, difficulty breathing and very pale skin. If untreated, this condition may cause death. If you or someone you know experience any of these symptoms, get medical help immediately. Allergic reaction rashes are often mild and more irritating than medically harmful. If you are experiencing a skin rash for several days, it may be wise to consult a doctor to help determine the allergen so that you may avoid it in future.